只要開啟我們想要開放的 port 即可,基本上要開的 port 也只有 SMB /NMB 而已其他你可以依據需求來開啟.預設是沒有選項可以勾選你可以透過其他連接阜做設定.要開啟的也只有 NetBIOS (UDP ports 137 and 138, TCP ports 139) 和 TCP port 445 for SMB file sharing without NetBIOS. 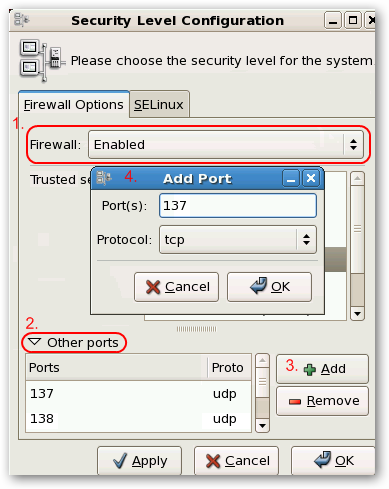 如果你是透過遠端的 SSH 這邊還有一個可以在 Text mode 下執行的. 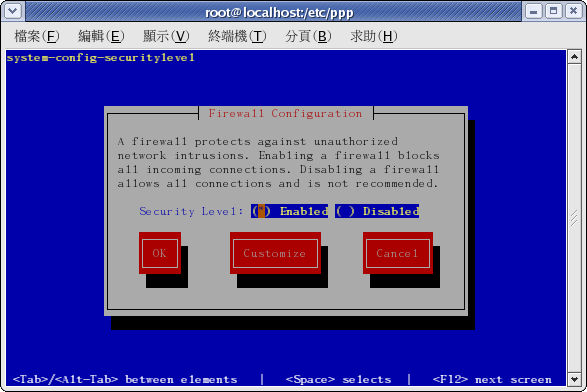 如果要開機時就啟動 iptables ,使用下面這個指令,就會在每次開機時啟動 iptables .